The Inter-Mountain photo by Edgar Kelley Senior Read Schumacher goes up for two of his 11 points during Elkins’ 78-47 win over Tucker County on Saturday night. 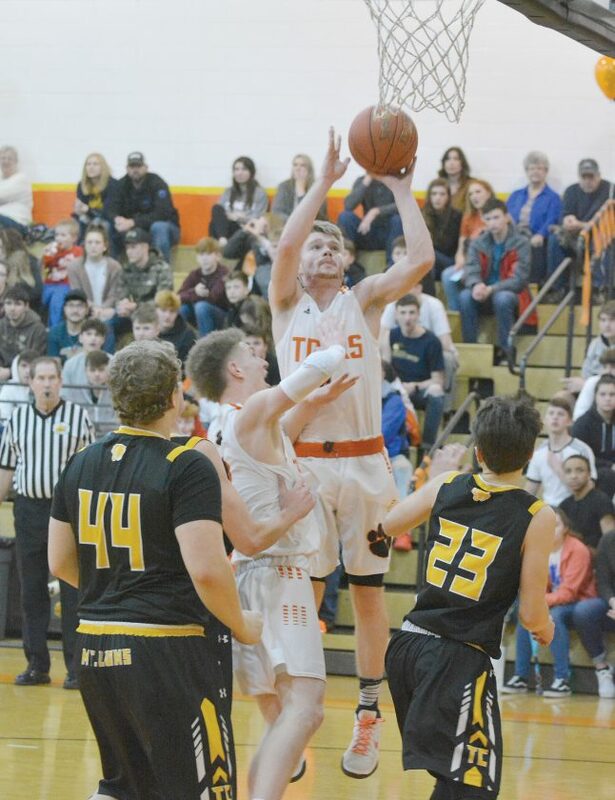 ELKINS — Senior Elliot White led three teammates in double figures with 22 points as Elkins rolled to a 78-47 win over Tucker County Saturday night in non-conference action at Richard P. Simmons Memorial Gymnasium. Senior Read Schumacher and Blake Harris followed White in the scoring column with 11 points each. Senior Donovan Wiles added 10 points for the Tigers, who improved to 13-5 with the win. White also came away with five steals and four assists, while Schumacher pulled down nine rebounds and had three dimes for Elkins, which forced 24 turnovers in the contest. DeAndre Owens just missed double figures for the Tigers with nine points. Elkins opened the contest hot and took a 10-3 advantage early after a White layin at the 3:48 mark. 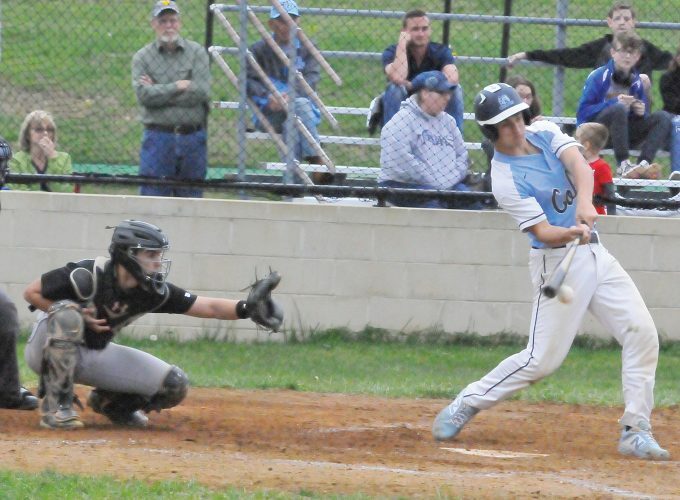 Tucker County battled back to cut the deficit to four points, at 15-11, when Cameron Wamsley knocked down a trey with 2:15 left in the opening stanza. The Tigers answered, however, ending the first quarter on a 9-2 run that saw the lead swell to 11, at 24-13. Four points from Schumacher and a 3-pointer from Wiles fueled the surge. The Mountain Lions rallied back with four straight points from Jeffrey Snyder to cut the lead to 35-29 with 3:00 left in the first half. But like in the first quarter, Elkins ended the frame strong, going on an 8-2 run to take a 43-31 cushion at intermission. The Tigers carried over the momentum into the second half and an 8-2 run to open the third quarter all but sealed the win for the hosts. White’s old-fashioned three-point play at the midway point pushed the lead to 51-33. Elkins went on to take a 60-38 cushion into the final quarter, where they outscored the visitors 18-9. Snyder was the lone double-digit scorer for the Mountain Lions (5-11) with 14 points. Wamsley and Corrick Ambrose followed with nine points each. 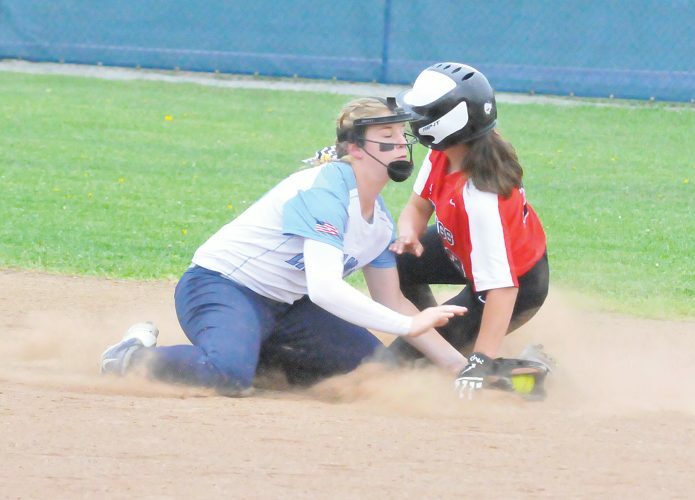 Tucker County will travel to Pocahontas County on Tuesday for its next matchup. Elkins will return to action on Thursday when it entertains Philip Barbour for a make-up game at 7:30 p.m.